A St. Louis Public Radio founder and longtime University of Missouri-St. Louis administrator has died. Donald Driemeier identified the need for a public radio station for the region in 1971. St. Louis Public Radio signed on about a year later, under its call letters K-W-M-U. He wrote the construction permit for the station, which was based on UMSL’s campus for years. The university still holds St. Louis Public Radio’s license. “We are indebted to Don Driemeier first having the vision that UMSL should have a radio station,” Longtime St. Louis Public Radio employee Mary Edwards said. “I also remember what a kind person Don was, always having a good word and a twinkle in his eye,” she added. Driemeier started at UMSL in 1965. He retired in 2004. Aside from being a longtime supporter of public radio, Driemeier served in several positions at UMSL. 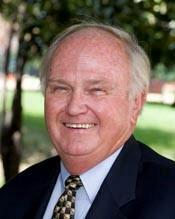 He was dean of the school of business, deputy to the chancellor and served as interim chancellor in 2003. He retired in 2004. “He deserves much credit for the progress of this university over his nearly 40-year career,” current UMSL Chancellor Tom George said in a statement. “Don’s experience and guidance were invaluable to me when I became chancellor,” he said. Driemeier spent his entire professional career at UMSL, starting in 1965. He received a bachelor’s degree from DePauw University in Indiana. He earned advanced degrees from Washington University. Driemeier died Saturday. He was 80. A cause of death has not been announced. He was a father of three and had six grandchildren. Driemeier and his wife Joyce were married for nearly 60 years. 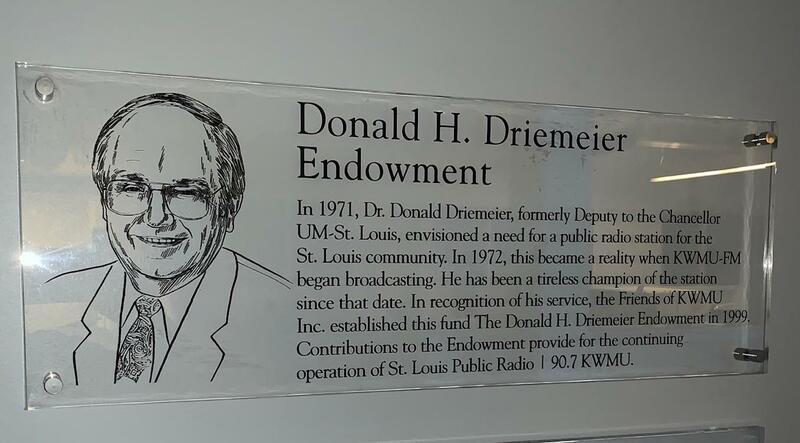 A plaque honoring Donald Driemeier's contributions to launching St. Louis Public Radio hangs outside the station's boardroom. A celebration of life for Donald Dreimeier is set for Tuesday at 1 p.m. at Samuel UCC Church in Clayton. UMSL said memorials can be made to the College of Business Administration, Samuel UCC or Eden Seminary. St. Louis Public Radio and the University of Missouri-St. Louis broke ground on a new midtown facility at Grand Center today. The new St. Louis Public Radio is being built on a parking lot currently being used by the Fox Theater.